The progress of Xtractor 2018, which will follow McCormick X8 and X7 tractors as they tour South Africa, will be featured by main sponsor BKT on a mini website at http://Xtractor.bkt-tires.com. The website has been created by the multinational corporation headquartered in India for the purpose of fostering its significant contribution to the expedition and inspiring the audience’s interest and passion. The entire Xtractor adventure can be witnessed on the official BKT social channels with weekly comments and real-time news of the most exciting and astonishing moments of the journey. This way, followers will continuously be updated with all happenings and occurrences around the venture, and can share the team’s emotions and the breathtaking challenges they face while driving the McCormick tractors equipped with BKT tires on the trail of unexplored routes. 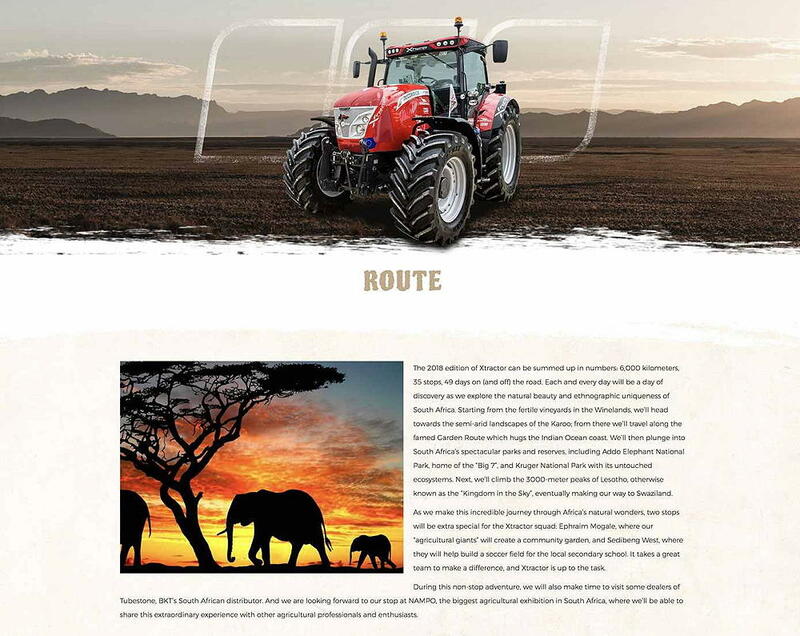 The website has three main sections: Expedition, highlighting BKT’s role as a sponsor and tyre supplier including the display of the products equipping the McCormick tractors, that is Agrimax Force and Agrimax RT657 tyres; Drivers, where you can find the six drivers’ profiles enriched by some personal photos and chatter; and Route, narrating in detail the entire expedition by means of comprehensive photo documentation. Xtractor 2018 carries on where Xtractor 2015, which took place in Australia, left off. This year's event will cover 6,000km and feature 35 stops diuring the 49 days on (and off) the road.